Published: August 1st, 2018 by admin. Filed in Shade Sails and tagged Waterproof Shade Sails. When looking for a shade solution, one thing you must understand is that there are many different types. From shade canopies to awnings, tension membranes and shade sails, each lends better to a particular application, but there is one that is pretty much a good ‘all-rounder’. As the owner of Ashadya Shade Sails & Blinds, let me tell you that waterproof shade sails are a much better choice as compared to the other shade options. And, I’m not saying this simply because we provide waterproof shade sails in Sydney, but rather because it is true. So, continue reading this post as I outline four solid reasons why you should opt for waterproof shade sails over other shade solutions. Whether you’re looking for a solution for your deck, patio, veranda or carport, waterproof shade sails are always the best choice! Compared to framed shade structures, fixed colourbond awnings, and pergola roofs, waterproof shade sails are much lighter and offer better flexibility than the other options at hand. Waterproof shade sails are also incredibly versatile, and they can be installed in a variety of configurations to suit your outdoor environment. They can cover large spaces more efficiently and effectively as compared to the other shade solutions. One of the biggest reasons to opt for waterproof shade sails is that they offer all-weather protection. As the name suggests, they are waterproof, so they offer 100% protection against the rain. They offer protection from the sun, rain, hail, and wind, and also offer a cooler, breathable and comfortable space underneath. Waterproof shade sails may offer great functionality, but they are also fantastic to look out. Aesthetically pleasing waterproof shade sails in Sydney, such as those offered here at Ashadya Sails & Blinds, are available in a range of colours, shapes, sizes and you can choose your design configurations. Thanks to this, you can choose a configuration that will complement the look of your home and create an architecturally pleasing shape. Finally, one undeniable reason to consider waterproof shade sails over other waterproof shade solutions is that they are affordable. Because waterproof shade sails can be attached to existing structures, cantilevered or free-standing, they can be shaped to suit any area and come with lower installation costs as well. There you have it, four solid reasons to opt for waterproof shade sails. 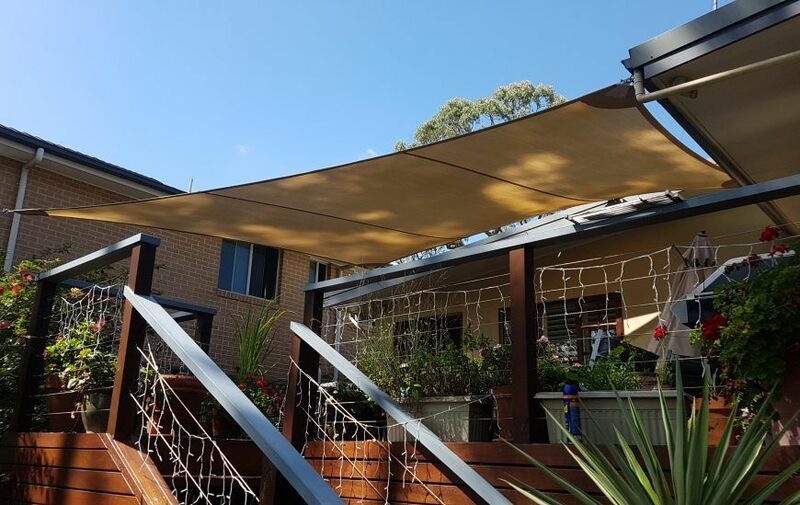 If you’re looking for quality waterproof shade sails in Sydney that will exceed your expectations, look no further than us at Ashadya Shade Sails & Blinds. We can custom create a waterproof shade sail to meet your specific needs and requirements. We manufacture our sails to stringent design standards to ensure maximum protection and comfort and use industry-leading fabrics including Ferrari 502, Polyplan 680 and Valmex 580S. So, you can trust that they will offer superior performance and durability. And, that’s not all – they offer UVR protection of up to 99% and offer extreme durability against weather elements. That’s why we back our shade sails with a 10-year manufacturer’s warranty against UV degradation. If you’re considering investing in a shade solution for your home, you should choose waterproof shade sails over framed shade structures, fixed awnings and pergola roofs. That’s because waterproof shade sails are versatile and offer great all-weather protection, they look fantastic, and they are far more affordable as compared to other fixed shade solutions. When it comes to an affordable and 100% waterproof solution, nothing beats waterproof shade sails. Our waterproof shade sails are perfect for creating outdoor living areas that can be used all year round and regardless of the weather. For high quality, yet affordable waterproof shade sails in Sydney, consider none other than us at Ashadya Shade Sails & Blinds. If you live in Galston, Hills District, Hornsby, North Shore, Mt Colah, Gordon, Berowra, Mt Kuringai, Castle Hill, Dural, Glenwood, Glenhaven, Kellyville, Glenorie, Pymble, West Pennant Hills or the surrounding areas of Sydney, call us on 1300 570 901 for a free measure and quote.